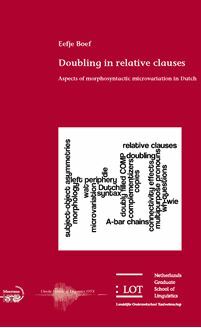 Eefje Boef Doubling in relative clauses Aspects of morphosyntactic microvariation in Dutch This thesis presents a study of microvariation in ( long - distance ) restrictive relative clauses and related constructions in Dutch . It shows that a proper understanding of the attested microvariation , and in particular pronoun doubling in long - distance relative clauses and ( embedded ) wh - questions , yields new insights into the structure of A - bar chains , the syntax of relative clauses , the structure of the left periphery and the nature of ( relative ) pronouns and their relation with complementizers . More specifically , this thesis provides a unified analysis of doubling in relative clauses and ( embedded ) wh - questions , a reevaluation and reinstatement of ( a revised version of ) the traditional head external analysis of relative clauses , and a new implementation of an underspecification approach to so - called multipurpose pronouns and complementizers . This study is of relevance to scholars working on morphosyntactic microvariation , doubling phenomena , the structure of long - distance A - bar chains , the syntax of relative clauses and the nature of relative pronouns and complementizers , as well as to a general syntactic readership .